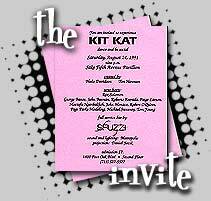 The concept of Kit Kat came from Blake Davidson & Tim Hannum. They wished to produce a festival event and a grand venue. They had the concept, but no mailing list. They knew that the Sun Rise Cocktail Club's mailing list consisted of over 5,000 people after just a few months of hosting after hours parties and a couple of events at Metropol and Avalon's Loft. The first Kit Kat was a blow out. Over three thousand people attended the massive party at the Saks Pavilion on Post Oak.